I saw in the news the fattest guy in the world died Christmas day in Mexico. He weighed 980 pounds. The previous fattest guy, also a Mexican, weighed 1230 pounds. Those weight figures were their peak weights. Both of them had lost weight before they shuffled off their mortal barges. I don’t know if that screwed up keeping track of who the champion was or not. The article didn’t say. The photo, by the way, is just some random “heavy set” guy. Interestingly, the heaviest human ever recorded was an American (USA! USA!) and he tipped the scales at 1400 pounds. Sadly, he died in 1983 and the US has been sliding ever since. By 2013 Mexico mooved ahead of the United States to take the most obese nation in the world gold. 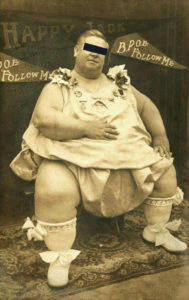 This 1400 pound guy had another record: The greatest weight difference between a man and woman getting married. His bride was 110 pounds. The guy fathered two kids. Obviously his wife liked to be on top. That isn’t all she liked, but I don’t like to speculate and in fact, I don’t want to know. I think she’d have to be sort of mentally ill (more on mental illness in a moment) to marry a guy who outweighed her by more than a thousand pounds; unless he’s rich. Trouble is, though, I think guys who win the fattest man in the world title rarely are. I guess it could be argued these guys had eating disorders. Here’s the problem with that reason: If the guy was eating an amount that would maintain his weight, but not so much he would steadily gain weight, and he still gained weight, I could buy it. It sounds physically impossible in the absence of a weird medical problem, but apparently that wasn’t what was happening. 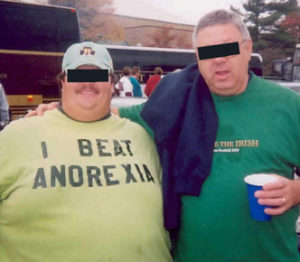 I guess it could be argued these guys had eating disorders. In fact it’s pretty obvious. But the disorder is they eat too much of the wrong kinds of food. And that’s a mental illness, or emotional problem, whatever you want to call it. Gradual changes are harder to notice than sudden changes, but if there’s any kind of change to a person that’s obvious, it’s as they gain a spectacular amount of weight. If a guy is eating enough to become morbidly obese it’s going to kill him and that’s obviously not rational behavior. If these people are obviously insane, you’d wonder why the Nanny States of America would let them do that. Not only is the guy going to be a burden on the health care system, he’s packing away enough food for four or five people. Now in a collectivist system, a guy would simply not be allowed to do that. He’d be arrested and put into hard labor. Don’t miss that video: You only have to — wait for it — 11 seconds. Thank God we live in a place where a man can eat himself to death if he wants whether it’s because he’s obsessed and crazy, or for national pride. It’s his right. If a guy wants to ride a motorcycle without a helmet, I say let him. If people want to smoke, or drink too much or do drugs, let them. Let everybody be responsible for their own choices and forget trying to legislate mental issues or morality.